Steven Stamkos of the Tampa Bay Lightning congratulates Nikita Kucherov on a powerplay goal against the New York Islanders on Nov. 1, 2016. Brayden Point has a chance to get on the roster with fan voting. TAMPA, Fla. -- Two players from the Tampa Bay Lightning will be headed to the 2019 NHL All Star Game in San Jose, Calif., but there's a chance for a third player to be voted in by the fans. 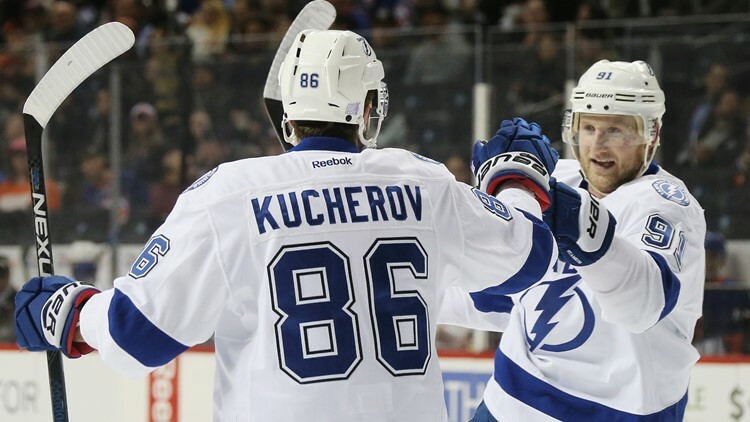 Team captain Steven Stamkos and right-wing Nikita Kucherov were named to the Atlantic team, NHL.com announced. It's Stamkos' sixth trip to the game, and Kucherov's third. Forward Brayden Point is among the eight players competing to be the "Last Man In," who will be selected by fan voting on NHL.com or on the NHL app. In 2018, five Lightning players made the All-Star roster, as well as coach Jon Cooper. The game was played at Amalie Arena in Tampa. The game will be Jan. 26.